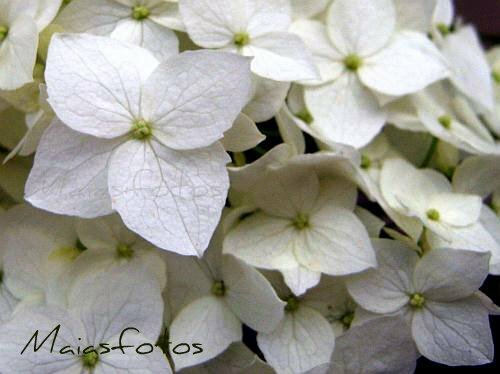 Hydrangea (Hortensia) is a very popular, small shrub, much appreciated in home gardens and landscapes, for its showy flowers and rich foliage. In most species Hydrangea flowers are white, but in some species, like Hydrangea macrophylla, the flowers can be pink, blue or purple shades. Hydrangea macrophylla is native to Japan. 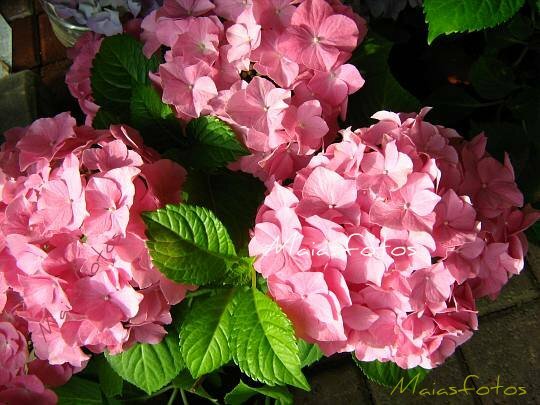 It is widely cultivated in many parts of the world and also known by many other names as Hortensia, French Hydrangea, Mophead Hydrangea. a color change of the flower pigments takes place, in the presence of aluminium ions taken up into the plant from the soil. - the flower color often mirrors the pH of the soil; neutral soils produce very pale cream petals, acidic soils produce blue flowers and alkaline soils results in pink or purple. Hydrangeas are a beautiful addition to our homes, as indoor plant for winter. Flower centers offer plenty young, potted plants, in autumn and winter. Look at this giant hydrangea flower head, twice the size of a human head. an interesting post. I did not know about the coloring. .) Beautiful shots too. The coloring is lovely and what a beautiful shot with that lighting. So many beautiful colors of hydrangea flowers. Love all the varied colors. Beautiful flowers, and great capture, Maia.. I think hydrangeas are so beautiful, and I especially love blue ones. That doesn't mean that I can grow them, though. I have a greenish-white one and just bought another plant this fall; the problem is that the deer love the plants in the spring! There's plenty of them here! 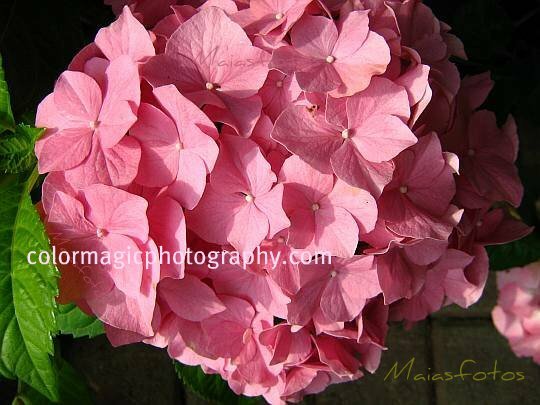 I've seen the blue and green hydrangea around but pink is my favorite. One of my favorite flowers! Beautifully captured! Frighteningly gorgeous. I have a weak spot for hydrangeas, but they don't like me. I love them! Oh, if I can only have some in Heaven without my dogs trampling over them. Sigh. Beautiful hydrangeas! We call this flower, a million dollar flower. It really is worth that! Thanks for the waning. I came across to this kind of form, and I think I commented twice. But I really felt something odd after the second time. 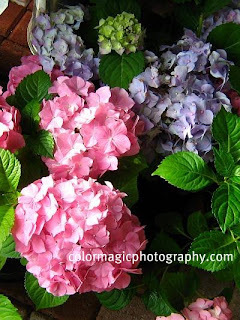 ahh the colour of hydrangea flowers - I can manipulate the colours and turn a pink one to blue and a blue one to pink and thats not using photo editing :) just by changing the ph of the soil. Lovely photo Maia. I'm going to link in with my cyclamen post. You are right Lui, from one point of view: it's easier. Unfortunately, that comment form allows anonymous comments also. Believe me, there are many spammers, especially visiting meme lists. I never knew that about those comments. I used them for a few days on one of my blogs during the summer and then went back to blogger. The more info, the better. I love Hydrangia. So many types out there. Beautiful! Always love to visit your blog, such beautiful images. I must have missed last week, I did not see that spectacular dandelion. Wow! Love ii! I didn't know that the soil affects the colors of the flowers. Thanks for the information. I haven't seen that comment box. When I clicked on your thumbnail to get a better look, it did not enlarge, however. Sounds pretty bad, however. I do love hydrangeas and here in Seattle I have a few flowers still! Showing a white mum this week. Thank you Sara, sorry. It is fixed now. Uma hortência linda em uma imagem perfeita! Parece que a flor vai saltar fora da tela! Parabéns!